The Flower Power Hour Is Upon Us | Yo, Yenta! Oooh, y’all known I love me some flowers, and azalea season in full riot in Savannah: Please read my article on “Azaleashock” in the Savannah Morning News! Spring has sprung forward and I’m waiting in my front yard. The air holds a vague promise of the months of warmth to come, but this morning it still stings cold, and I tuck my cheeks into the collar of my jacket. Now, it’s not unusual for me to stand vigil in front of my house so I can shake my fist at drivers peeling past at unacceptable speeds. But today I’m not minding the street—only the line of dark green shrubs underneath the living room window. These bushes, festooned with tightly-spiraled buds, are about to transform my yard into a magical wonderland of color. I’m determined to witness the exact moment these buds, sleeping like hundreds of tiny baby dolls, hear the clarion call sent silently through roots and stems that signals them to swivel open and show their full faces to the world. It happens every year in Savannah: One day everything is its usual ho-hum green, and the next morning it’s pinks and reds and purples and white in every yard, down every block, along every square—like heaven had a pep rally while we were sleeping and forgot to clean up the confetti. I grew up in the concrete suburbs of Arizona, a place where stunning displays of color come not from foliage but from light dancing upon red clay cliffs and fuchsia sunsets fueled by city smog and dust kicked up off the desert floor. Medieval castles of cumulus clouds are set ablaze on certain late afternoons, bathing the basins of land in apocalyptic orange. When I sang about “purple mountain majesties” in elementary school, I was quite sure Katherine Lee Bates, the lyricist who wrote “America the Beautiful,” had the spikes of the Superstition range in mind. In my 20s, I wandered into the redwoods north of San Francisco and was bowled over by the vibrant greens of the rolling hills and varied browns of Muir Woods. For most of the year, the Bay Area’s famous fog would not so much tiptoe in on little cat feet as it would drape a silvery blanket over the landscape, crisping and separating the hues of the forests until it made my eyes hurt. Until I saw it juxtaposed against the loamy dark soil and feathery ferns, I’d never understood that gray was actually a color. Yet none of this prepared me for the red and pink riot of spring in Savannah. “Azaleashock” best describes the dizziness brought on by witnessing so many blossoms at once. Swoon-worthy clusters of cotton candy pink and seashell coral, tufts of grape purple and lipstick red to die for. In the morning light, the spectacle appears almost supernatural, especially when it’s set off by the sheen of golden yellow pollen powdering everyone’s windshield. After transplanting from one coast to the other five years ago, I was deep in the throes of my first azalea stupor when we first walked up to a non-descript brick Midtown ranch with a “For Sale” sign. Our realtor didn’t try to hide her impatience; she was already sure I’d reject this one as I had the hundred or so others we’d traipsed through. She didn’t bother to hang up her cell phone as she unlocked the front door to wave us in. While my husband crossed the threshold onto hardwood floors and an open layout, I lagged behind in the yard, which was shimmering on all sides with pink and red and white flowers, not just with azaleas, but saucer-sized camellias and loppy-eared tulip magnolias. Next door and across the street, more colors radiated in front of every house all the way down on this well-kept block. It was the remodeled kitchen with its granite countertops that firmed my husband’s decision; my mind was already made up before I walked in the door. Of course, by the time we moved in the yard had receded back into an unremarkable greenness to sleep for another year, but I knew the next spring held. We experiment with different mulch combinations and feed our shrubbery throughout the seasons, rewarded each spring with a few weeks of glorious blooms. During this time my Facebook page is filled with photos of close-ups and wide views, the antics and accomplishments of the children and the dog ignored until the last wilted angel drops. Even after multiple seasons, my Azaleamania continues unabated. 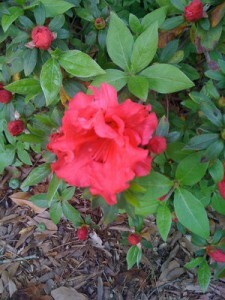 Judging from the Internet action on the subject of the South’s azaleas, I know I’m in good company. When I cruise down the column of color on the main drag of Abercorn between Victory and Derenne, I still stick my head out the window like a wind-hungry Labrador, lapping up the view. So that’s why you’ll see my back if you drive through my neighborhood, even if you’re peeling through far above the speed limit. That’s me, sitting on the winter-fried grass in front of my shrubs like an anxious father on prom night minus the shotgun. Azalea season is almost here and it’s only a few weeks long, and I don’t want to miss a minute. This entry was posted in Life, Death and Guilt In Between, Poetics and Published Pieces by Head Yenta. Bookmark the permalink. I’m pleased/ashamed to say that I’m also the crazy lady standing in front of my house screaming at speeding cars.